The Vedas are the main scriptures of the Hindus. There are four Vedas. They contain hymns in Sanskrit to various gods, for example, the Surya (sun), Agni (fire), Ushas (dawn) and so forth. These hymns that date back to about 2500 B.C., were transmitted orally from generation to generation until the art of writing was invented. Although the majority of the hymns indicate that polytheism or worshipping of multiple gods was being practiced in India during the Vedic civilization, the notion of One God was distinct as well in many hymns. Notable is the hymn 1.164.46 of the Rig Veda. Such monotheistic concepts culminated into the VEDANTA philosophy in the concluding sections of the Vedas. The VEDANTIC philosophers critically analyzed and rejected the notion of multiple gods and goddesses and founded a profound system of philosophy that is not only in tune with the modern scientific thought but may also seem to provide a rational explanation about the universe around us and our lives in general. In other words, God is ONE; people following different faiths, worship Him in different forms. Men and women, in their essential nature, are divine. "Blessed are the pure in heart; for they shall see God". There are many ways to realize this divinity. They are called Yogas. VEDANTA is not merely a speculative philosophy without any practical utility. It is a way of living and realizing. It gives full freedom to each individual to evolve morally and spiritually according to his or her faith and conviction. It includes various truths found in all religions of the world, including the teachings of the world's great saints and sages. In VEDANTA is found a reconciliation of religion with science, of faith with reason. A Vedantist is a seeker of truth who accepts and respects all religions as paths to the same goal. 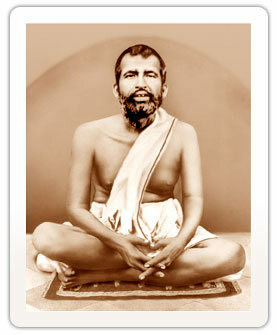 Modern VEDANTA is exemplified in the lives and teachings of Sri Ramakrishna a great prophet of nineteenth century India (1836 - 1886), and Swami Vivekananda (1863 - 1902), his foremost monastic disciple. Swami Vivekananda, the first teacher of VEDANTA to the West, taught VEDANTA in USA and Europe between 1893-1897 and between 1899-1900. Gospel of Sri Ramakrishna, originally recorded in Bengali by M.
Translated into English by Swami Nikhilananda and published by Ramakrishna-Vivekananda Center, New York. Published by Advaita Ashrama 5 Dehi Entally Road, Calcutta 14, India. You can buy these and other books on VEDANTA from any Vedanta Centre or the BOOKSHOP.